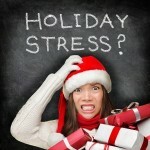 Tis the season to be…stressed? Originally published on the Urban Blog at Urban Lucy. There’s something about the run up to Christmas that can send even the most easy going person’s stress levels soaring. If I suggested that you put your lengthy to-do list to one side and lie down for twenty minutes right now, what would your response be? (I think I can hear you shouting that you’re too busy from here!) Maybe it would feel lazy or indulgent when you have so much to do? But I invite you to look at your life and ask what you hold most dear. Of course, we all have responsibilities and obligations we must meet. But busyness and meaning are not the same thing. It comes back to balance and being able to tune in to what your body needs. I’m a qualified restorative yoga teacher and for me, one of the joys of a restorative practice is that it gives us the permission to do less for our own benefit. I love practising and teaching dynamic yoga too, and there are those days when there’s nothing like going for a run to clear your head. But sometimes, what our bodies need is to be still. Sometimes referred to as ‘active relaxation’, in this style of yoga, props including (but not limited to) bolsters, blankets, blocks, and eye pillows, are used to facilitate relaxation by supporting the body. While the body is supported there is no need to ‘hold’ a posture, so we are able to completely let go, giving the body the opportunity to rest. In order to relax fully it is very important to feel comfortable in each pose, re-arranging your props as much as you need to before settling. If you’re fortunate enough to be able to make it to a restorative yoga class in your area or have a teacher come to you, then that’s brilliant, but if not you can still reap the benefits at home. A good place to start is with this Supported Savasana. If I’ve been rushed off my feet and feel frazzled, I’ve found that doing this before bedtime makes a real difference to the quality of my sleep and calms my busy mind. fingers will curl towards your palms. If you find twenty minutes feels like it whizzes by then try thirty minutes, but if twenty minutes is way too challenging to begin with, then gradually work your way up. I’d suggest seeing if you can do this Savasana once a day for five to seven consecutive days. Judith Hanson Lasater, who I trained with, jokes that restorative poses are magic, the magic being that they only work if you use them! If you’re interested in learning more then Judith’s book Relax and Renew: Restful Yoga for Stressful Times – one of my previous Books of the Month – is a wonderful place to start. NB – If you are in London over the Christmas and New Year period and would like to be guided through a full restorative practice then my regular Relax & Restore classes at Embody Wellness in Vauxhall will still be taking place 7-8.15pm on Fridays 20th and 27th December, and 3rd January. I will also be covering the Basic Yoga class at Embody directly before from 6-7pm on these dates. Here’s to less stress in December!